Got a rumor? Want to know the answer? Mark Post has signed young gun Rob MacCachren as codriver of the #3 Riviera Trophy Truck in 2007. Rob's duties will be to share driving duties during each event in 2007. 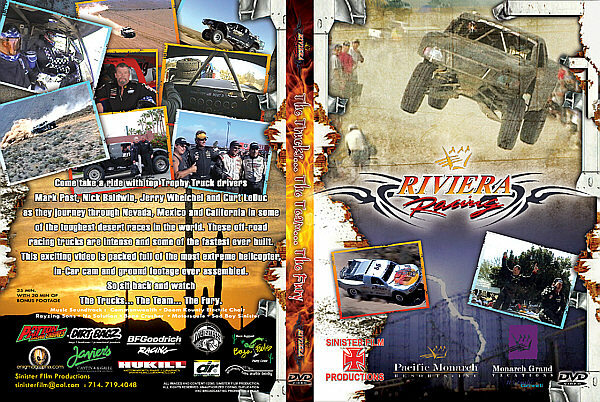 Riveria Racing has announced they will be racing a full 2007 series schedule in BOTH the SCORE and Best in the Desert Racing Association Series. Congratulations Mark, Rob MacCachren is a great fit for your team and should move your team into contention for 1st overall at every event. Jimmy's getting Married to long time girl friend Tiffany in MI this weekend. The couple will reside in Parker Arizona and are looking forward to Jimmy's return to a full time racing schedule in 2007. Chalk one up for the performance aftermarket! MSD Ignition has obtained a Permanent Federal Injunction against Procomp Electronics, Inc. Procomp manufactured an ignition that was confusingly similar in appearance to the well known red housing of MSD's 6AL Ignition Control. With more and more infringement in the aftermarket, MSD's top brass got fed up and took the matter to the courts. In the end, a permanent injunction was granted. This means that, Procomp, including its parent company, subsidiaries, divisions, affiliated, successors and assigns, and any person acting in concert with them are immediately prohibited from manufacturing, selling, distributing, marketing or offering any ignition or similar product that utilizes a design identical to or otherwise confusingly similar to the design of MSD's labels or the design of the distinctive housing of MSD's Ignition controls, including MSD's 6AL Ignition Control. True... While I've been asked to withhold the team name, I've confirmed they have ordered two Trophy Trucks from the same builder. Watch DesertRacing.com for spy photos in early 2007. The team is fairly new to the sport and became infected with DesertRacing Fever during their first race in which they rented a Baja Challenge car last year. After their first race they went out and purchased a ProTruck to race this season. Now half way thru the season they have decided to purchase a new Trophy Truck. I'd like to say Good Luck to Roberto, Chris and Eric and congrats on moving up in class. To you Nay Sayers, I say feel free to call anytime at 909.650.5412, but don't get upset if I tell you like it is. I'm also happy to announce DesertRacing.com will be posting a couple exclusive trailers from this action packed video in the near future. So check back early next week. Nicks Ranger prerunner is still for sale. Now for you nay sayers, the rumors about Nick and Mark having a falling out are NOT true. These two are still friends and will be racing, pitting and doing the same old things they've always done, with the only thing being different is Nicks retirement. The Class 1 car is now going to be Nick's new prerunner. MCM Motorsports would like to thank the following sponsors: Geiser Bros Design & Development, Interco Tires, King Shocks, Desert Sports Magazine, Dirt Sports Magazine, Affordable Powder Coating out of Phoenix, AZ and DJ Safety out of So. Cal. Desert Sports & Recreation Magazine is working on a 3 issue series on the new MCM truck. Dirt Sports Magazine is also working on an article covering the new truck. Quote: "Alan had a flat and then discovered the air jack was broken, we were lucky to have Wayne Lugo loan Alan the use of his jack so he could change the tire prior to pit "B"..."
Given the facts involving this incident, it seems very suspect and possible some type of air support may of occurred, given the flight path of Pflueger's helo from the direction of the main pit and the timing of Alan's decision to skip a scheduled stop at pit "B" (where a helo can't land) only to stop @ pit "C" shortly after the landing of the helo I have some concerns... Since air jacks aren't a common pit truck item, did the helo return to the main pit to retrieve an air jack for Alan while he had the second flat... Remember he had two flats? Think about it, how did they manage to get a replacement air jack into the truck, because I seriously doubt they ran the remainder of the race without an air jack? Robby Gordon Unplugged shows you one of the most talented off road drivers of our time. The overall reasoning for this move is simply: "the boss wanted some new toys..."